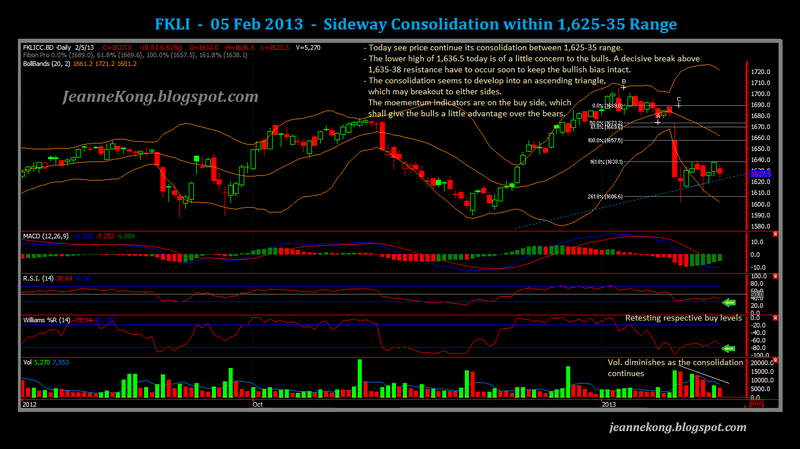 Today saw a broadly sideway move on FKLI, ranging between the 1,625-35 range. On the daily, price has consolidated to the upside since Jan 21-21 plunge low of 1,601.5, now seems to be forming an ascending triangle. Price was unable to break above the resistance yesterday's high of 1,638, which is of a little concern to my bullish bias on the index future. Given that an inside bar is formed on the daily, signaling a pause to previous strong move up from 1,620-38 the past two days. I'll give it another day for a price breakout from the consolidation phase. As of writing, DJI saw a surge over 100pts back above 14,000, as U.S. home prices grew 0.4% in December to stretch the year-on-year gain to 8.3%. That's nearly a 1% higher than the 7.4% growth registered in 2011, while being the strongest gain seen post-crisis. Encouraging housing data in the US, & that rally on DJI, if sustainable overnight, shall be a strong catalyst to a potential breakout tomorrow on our benchmark KLCI & FKLI. 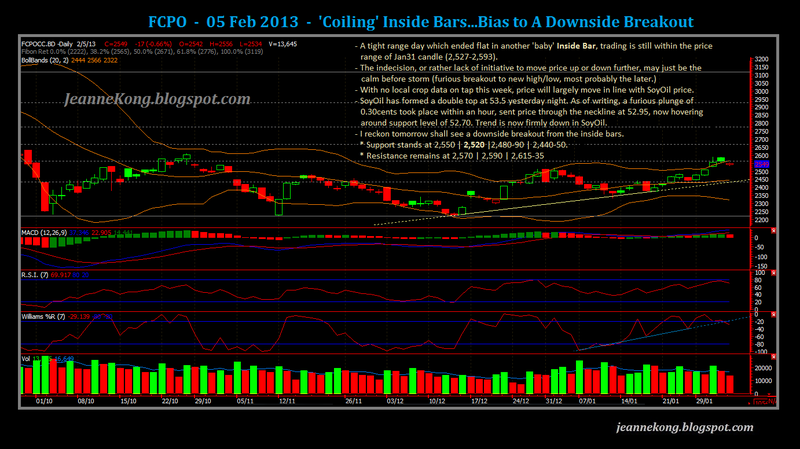 Another Inside Bar formed today, trading was tepid within a 20ticks range. 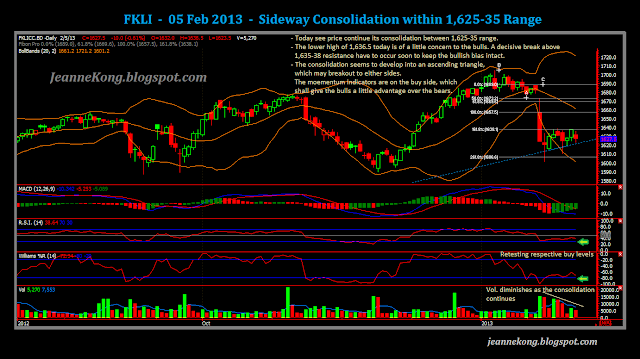 This indicates that traders are not ready to make the move yet, still pondering over their trade decisions. We will have to see on which side the breakout will occur, trading in its direction shall prove rewarding. Momentum indicators are on the high side, favoring the bears in this case. MACDh saw a first red which adds further to the downside pressure. Adding to the pressure, is the SoyOil price which is struggling to stay above the support levels of 52.70-52.95, after it broke below its double-top neckline at 52.95 earlier on at 2100h. 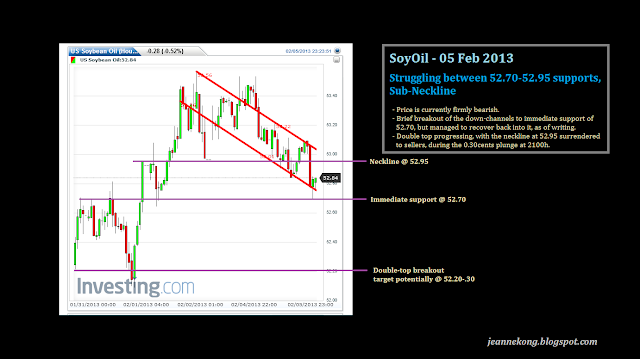 SoyOil is firmly bearish for the moment, though the rally on Dow has provide the bulls some respite, which is proven short-lived as price is again back below the neckline, as of now (@0032h). FCPO is pending a breakout, with a downside bias on weak SoyOil & bearish momentum indicators signals.